With the Renaissance, engineering knowledge was based increasingly on scientific laws with the accumulation of empirical experience. The great scientific theorists of the Renaissance period and the first modern era created a new knowledge which produced a multitude of engineers-inventors. In addition, the new notion of the engine as the only tool for industrial progress lead many governments to offer remuneration to inventive geniuses and to establish companies of scientists, exchanging information on the latest discoveries in order to share and spread them to every area of the scientific arts. The improvement of the basic materials during the 17th and 18th centuries also contributed towards the development of engineering. Metal gradual replaced timber as the material for civil building works, and coal and coke, which was more conveniently priced, started to be used as fuel instead of wood. Consequently, the ever-increasing use of carbon coke stimulated the invention of new methods of excavation and transport. The low cost of coal most probably inspired the invention and rapid modernisation of rail transport and the improvement of pumping technology. The need to pump water from mine tunnels kept engineers busy for centuries. (A book by Ramelli, for example, was dedicated almost entirely to this problem). A patent was recorded in 1698, by Thomas Savery, for "an engine to raise water by the force of fire". http://www.racine.ra.it/ungaretti/SeT/macvapor/savery.htm. 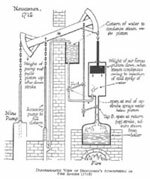 Savery had invented a steam pump. 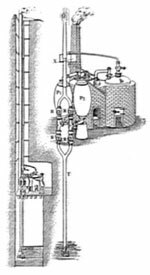 This machine was followed 14 years later by the first efficient steam engine, designed by Newcomen, http://www.racine.ra.it/ungaretti/SeT/macvapor/newcome1.htm which marked the start of the modern engineering age. Between 1750 and 1850, civil and mechanical engineers were the main craftsmen of the rapid industrialisation in progress in Western Europe and the United States. A collection of the results of these studies was presented in 1851 at the World Fair in London, where models of steam engines were exhibited and displayed on films using a projector by Cyrus McCormick http://en.wikipedia.org/wiki/Cyrus_McCormick. A series of American rifles were exhibited at the fair which had been produced using interchangeable parts: this was a forerunner of mass production. The fair was held at the Crystal Palace, a magnificent example of an iron and glass structure, which in itself was a monument to the skills of the engineers.